Picking one of the best universities for law is often critical if you want to get into a top law firm. This is especially true if you want to work for a magic circle firm in London. So how do we know what the top universities for law are? We look at student employment, satisfaction and course outcomes. 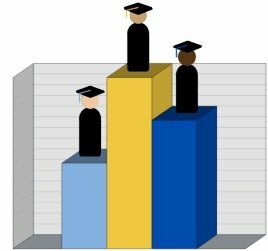 At studyinglaw.co.uk we think the best way to value a law schools prestige is the group it’s in, since this doesn’t change every single year. Confused? Don’t worry; all will be explained. To add to the confusion there’s also the other colleges of law, like BPP and CoL. Where do they fit into the ranking? Can you even compare them? The Russell Group – Made up of 20 universities who receive the majority of research grant funding. The Russell Group is know to contain the leading universities (and therefore some of the best law schools) in the UK. 1994 Group – Another group of research led universities. The 1994 Group describes itself as “internationally recognised universities in Britain, who share common aims, standards and values”. Many of it’s members are recognised as being in the top 20. This is a good starting point when looking at how good a university is for law. However not all universities belong to these groups, yet are still brilliant law schools. This is where resources such as the Times Good University Guide come in handy. However we will take a different approach at interpreting the data. The “best” university for us, will be the one which gives us the best chance of getting a training contract. This could be through the reputation of the university, or through their careers support & contacts. Student satisfaction, while very important, won’t carry as much weight when it comes to getting a training contract. Entry requirements can be important, but just because a university has high entry standards doesn’t mean its teaching is going to be great too. As you can see there are some odd results in there. Universities we would consider prestigious next to universities we wouldn’t. “Graduate prospects” is based on who has graduate level employment a year after leaving university. So this list is good if you want a job at the end of your degree. This job may not necessarily be in law though. So don’t put too much faith in these score. But if you want to answer the question “which university will give me the best chance of getting a training contract / pupillage?”, then it’s best to pick a Russell Group or 1994 Group university. Of course Oxford or Cambridge have consistently been the most prestigious institutions for law in the UK (and indeed the world). While taking your degree there won’t guarantee you a pupillage / training contract, it will certainly give you the best chance. Where do the colleges come in the league table? Can you compare getting a degree from one of the law school colleges to a university? And if you can, where do they come in the rankings? Unfortunately since they are not universities, they are not put in the good university guide. However we can look at other elements, such as entry requirements. BPP Law School and The College of Law have UCAS entry points requirements of between 300 and 320. This straight away ranks them in the same league (in terms of entry requirements at least) as the Russell Group universities. Learn more about the University of Law, and register your interest here. If you know that you want to go into legal practice, one of the law schools could be a good choice. They will have a greater emphasis on law in practice so there will perhaps be a smoother cross over to the legal practice course. If you are interested in going into law academically however a university will probably be the better option. It’s hard to say. It almost certainly will be cheaper than a university though; you do the LLB in 2 years and not 3. That’s around a £9000 saving. Most of the time “best” will be very subjective. The best could simply be the university you got the best impression from at the open day; the one who had the most enthusiastic lecturers or the most well connected careers department. The Times rankings (or any rankings) don’t tell the entire story. That’s why the questions posed in this article are very tricky to answer. This is even more confusing due to the fact that law entry requirements are usually very high in all law schools. It’s hard when picking a university to study law at – try to use a combination of all the criteria talked about; the “best” university is down to you. Ready to make a decision? Read about law at university and becoming a solicitor. Or look at our infographic of the British legal system if you’re tired of reading lots of words! Also be sure to check out some of the best law textbooks.